NID and CFBI-NID team consisting of C S Susanth, Subroto Sarkar and Ranjit Debbarma with Prof M P Ranjan conducted a workshop in Bangalore for the IL&FS supported team of craftemen from Sankhala cluster between 17 & 30 September 2009. A new range of products were designed and introduced which the designers felt would be attractive for local markets in Agartala, hence the product range included a number of versions of the local favorite called “Alna” – a cloth rack that is ubiquitous in Eastern and Northeastern India, however these are always made from wood. 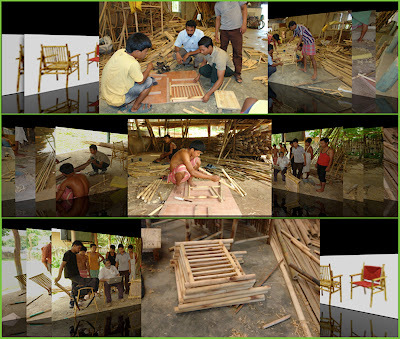 However this time we decided to use a modular knock-down all bamboo chair as the vehicle for production training and through which the Katlamara and Sankhala craftmen could be introduced to quality control concepts from raw material to end product using good practices and a well designed workflow and management system. This training workshop was conducted from 18 May to 28th May 2009 and full size drawings of the chair design were distributed to both workshop participants as well as other entrepreneurs and craftsmen at Agartala, Nalchar and to the students at BCDI. The design strategy included elements of the micro-macro design approaches that we have been advocating over the years through the Centre for Bamboo Initiatives at NID to include detail design, product design, tool design, process design, brand building and the macro economic strategies of farm to market with many embedded links that makes the whole both complex and potentially viable in the face of multiple challenges in the area of design for rural development in India today. The IL&FS team is headed by Sharmishta Mohapatra who is supported by S Metoulebi at Agartala and Kirat Debbarma at Katlamara and Sankhela clusters. 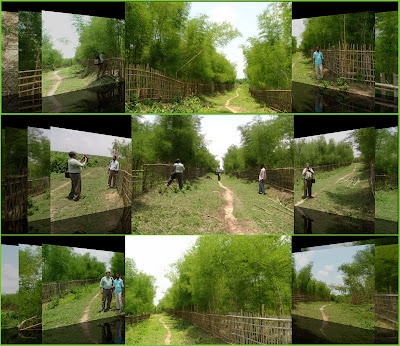 Image01: What was a small farm over a couple of acres near Katlamara has now grown to cover 20 hectares of Kanakais bamboo located at Mantala about 5 km from Katlamara. The promise for growth of the bamboo products market gives the farmer in Manna Roy the courage to expand when all others around him are planting rubber. Only time will tell who will take the cake and eat it too. “Good Design” – is like a fertile seed that is a product of human imagination and supported by deep convictions of experience from explorations that could be spread over the land to generate huge value for all stakeholders. Only when it is nurtured and cultivated does this seed generate value and produce a farm or a forest which is a manifestation of the seeds potency and this nascent value is quite invisible till it is eventually realised on the ground, a bit like the chicken and egg dilemma. This is why we as designers have to struggle to make our visions and convictions accessible and visible to politicians, administrators and industrialists – all those who need our services – and this will always be the case for good design. I believe this will be the case since these design actions are located at the leading edge of the future that we wish to build and these design intentions and the early actions that require support continue to remain invisible till these have sufficiently matured and manifested themselves in visible signs that are tangible and perceptible to onlookers. Even then many attributes and intentional relationships will remain invisible since these would need to be explained before they can be understood to be an outcome of our intentional thought and a product of the design process itself and not an inevitable happening. Image02: This time, the ‘design seed’, is the newly designed bamboo arm chair that can be made from four major frames and two tie frames, all pinned together with pre-drilled bamboo dowels. No metal nails or screws here so all materials are from the rural farm and with the use of simple jigs and fixtures these frames can be drilled precisely for post-transport assembly at the point of use by the eventual buyer. This opens up the possibility for low complexity knock-down furniture that can be made locally and then shipped easily to all Indian destinations at a low cost. The designed seed that can transform the local economy and its inhabitants over the long term. Can we support and nurture this strategy? 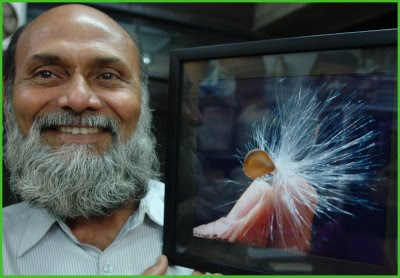 In 1988 J L Naik and I had discussed this particular view of design as a concept for the proposed Eames Award Trophy and last month Naik gifted me a picture that he had taken of a seed that would be dispersed by wind with the fine fibres attached that can carry it far from the source tree in order to find fertile grounds in order to germinate at an appropriate time and climate. This is nature's strategy which works if sufficient seeds are produced that are viable and we too will need to work with those who appreciate our actions and wait for the climate to turn in order to realise our intentional missions. I am attaching below a picture that I had taken of Naik with his photo gift that I did use in a blog post earlier this month. 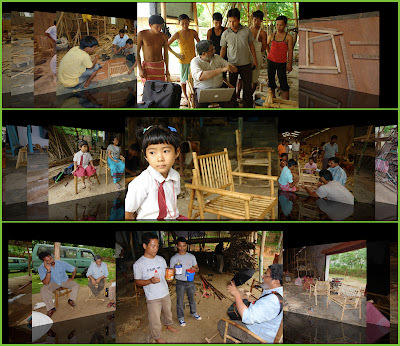 Image03: This design story is not about the chair but about the people who make and the bamboo products and they need to learn to do costing, learn the technology, and educate their children as well as make a reasonable living all at the same time. This is what the design schemes need to address in the face of all cards being stacked against the producers for so many years. Can the winds change and bring fresh perspectives to the remote land? In Tripura this time we are trying to excite many producer groups in and around Katlamara where we started our major efforts several years ago with an outpouring of design offerings and this time Susanth and I are holding back our creative juices to make just one product in a systematic manner from raw material to end product using a well thought up process design through all the stages of production with the use of good practices that are articulated and captured in the form of jigs and fixtures which is the stress that we are making this time at the two centres of training in Tripura – Katlamara being one and the other a new centre of Sankhala, about 5 km from Katlamara. Both these groups are being placed in competition with each other, one at Katlamara with a wage compensation training scheme under the IL&FS programme and the other at Sankhela with piece rate offer only. The piece rate group at Sankhala seems to be more motivated, let us see how it develops as the year rolls forward from here. Image04: Both groups cooperate to book a shared Jeep Taxi that transports ten craftsmen and fifteen new chairs from Katlamara and Sankhala to the rubberwood factory in Nagicherra to make use of their good quality spray painting facility. Lack of power and a compressor at both locations can be offset with a small investment in a micro-generator and a small compressor, all affordable if Government policy is swayed in that direction. Like the metaphorical design seed that I have been talking about in the previous paragraphs I have been distributing full size drawings of the bamboo chair that I had designed specifically for production in rural settings using solid bamboo culms and poles of small diameter to many other potential producers – Sanjay Das from Nalchar, the other one is Bhola Nath Bhowmik of Agartala, son of the late Rathi Ranjan Bhowmik (who passed away recently) – Others who have shown interest are the Tripura Rubber Wood Development Corporation at Nagicherra near Agartala that is showing interest in development initiatives in bamboo cultivation and furniture production due to the interest of one of their senior techno-managers, Madhumita Nath whom we met at their factory. These chairs were showncased at NID at a number of exhibitions as well as in New Delhi at the Northeast Trade Fair and later in Germany at exhibitions in Berlin and Stuttgart through exhibitions organised by IFA. These experiences have given us the conviction that the market will accept these design offerings and we therefore have decided to transfer the designs to the field for use by our local craftsmen at Katlamara and Sankhela. 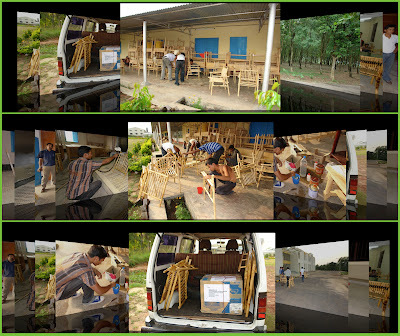 Image05: The closing exhibit was organized at the BCDI in Agartala much to the joy of the BCDI students and next day three collections were put up on show – The Bangalore Collection from the previous workshop, the Sankhala and Katlamara batch production of knock-down chairs and the new set of bamboo items from the rubberwood factory. The knock-down chairs were taken to the local courier bookong centres to get estimates for air shipment rates to Kolkatta, New Delhi, Bangalore and Ahmedabad. Will this supply chain get rooted and help a local forest grow? Only time will tell. We hope to see all of them adopting the strategies that we are advocating at Katlamara. This one chair is the seed of a much larger strategy of getting good production systems in place that can be applied to all the designs that we have in our rapidly growing archive of design offerings. I am attaching a series of pictures that are selected thumbnails of the last few days, one picture from each day, take a look, and I will be using these to tell the story more fully on this blog later this month. The two groups have produced ten chairs each using the production jigs that were introduced to them and the results are very encouraging indeed. Today, exactly ten days after we introduced the new designs to the two groups we brought the chairs to the BCDI campus at Agartala for an informal exhibition of the products of both our workshops with the IL&FS team. The products that were developed at Bangalore during the workshop at IPIRTI and NID Bangalore as well as these new batch produced chairs were placed on display at the BCDI which is another link in our micro-macro design strategy being the educational component of the larger plan for the bamboo sector as a whole. The students of BCDI were excited and they represent the future of the craft in the days ahead. Local officials from the Tripura Government came by and the trainees too had a chance to interact with all the visitors in a stage of high expectation and finally the film crew from the NMBA interviewed me at the BCDI exhibit venue and I hope our message reaches the cloistered heights of the National Mission’s headquarters in New Delhi. Download IL&FS Bangalore_NID IPIRTI Workshop Report 5.1 MB pdf. Download "Katlamara Chalo Book as pdf 46.5 MB size"
The National Institute of Design (NID) was conceived 50 years ago through the Eames India Report (1958) that was commissioned by the then Prime Minister of India, Pandit Jawaharlal Nehru. We are once again at a crossroad having inducted a new Director at NID, this time from the ranks of the NID Faculty, and it is time to introspect and try and regain leadership in a nation that is in the midst of rapid change. There is new hope that the Director, Professor Pradyumna Vyas will be able to open new initiatives as well as cement all the valuable traditions that were rudely disrupted through the number game which came at the cost of both content and quality. Design needs to grow its footprint in India but this has to be done in the spirit of Eames and not at any cost. The challenges are huge and this got me thinking and my offering was a list of 50 agenda points that could be the subject of open discussion, debate and rapid action in the days ahead. I shared this list with my faculty colleagues at NID and with the Directors’ call to our alumni and the design professionals in India through his mail to the DesignIndia list on yahoogroups we have set the stage for a sharing of ideas and to build consensus for the path forward from here. My list is quoted below as a container that needs to filled and fleshed out in detail in the days ahead. Image 01: Historic images of NID designed Logos for Indian Corporates at Paldi Campus and Pradyumna Vyas being welcomed as the new Director NID by a faculty from IILM, Gurgaon at an NID Alumni meet in New Delhi last week. 64-69 Report Documentation NID 1964 – 1969 which has been available for some time as a pdf file (link pdf file 25 mb) which must have been based on an internal report prepared by Gira and Gautam with Kumar Vyas titled report 63-69 that has now become available to all of us (pdf file 112 kb) after being kept a closely guarded secret for some unknown reason all these years. The first significant institution building offering was by Gautam and Gira Sarabhai who gave us the NID Structure Culture Document (download pdf file 360 kb) as a basis for sophisticated behavior and Institution building norms that guided the difficult period when Vice Admiral Soman left NID while raising many challenges for the NID Management and the Government of India. This was followed by the Thaper Committee Report (download pdf file 780 kb) that was led by Romesh Thaper and brought in change at NID with the arrival of Ashoke Chatterjee as the Execitive Director in 1975. The next intellectual significant offering was in 1979 with the drafting of the UNIDO-ICSID Ahmedabad Declaration and the Major Recommendations (download pdf file 11.1 mb) followed by the first of a series of Forward Plans (copies not available) instituted by Ashoke Chatterjee with Faculty involvement. AC’s influence continued well into the period when Vinay Jha came to NID and long after with Vikas Satwalekar at the helm. In 1989 we got the Dr Kamla Chowdhry committee report that spelt out the action plans with mission and goals in their “Future Planning and Forward Plans” report (download pdf file 5.5 mb). There are many internal reports that are still unpublished like the minutes of the fifty plus Faculty Forum meetings that are still confidential in the age of RTI and transparency of good governance. I hope this will change and those discussions too will be open to public gaze at some time soon particularly since we need to bring our alumni into the Governing Council and into the India Design Council, both of which need to have the wisdom of our design practitioners and its internal faculty and student body to guide the future actions in the days ahead. I have been thinking about this “Seed” metaphor for Design for India ever since I came in touch with John Chris Jones’ book “Design Methods: Seeds of Human Futures” way back in the 70’s. Over the years I have realized that “Design” is indeed like a seed that needs to be carefully nurtured and cultivated before it yields value, real perennial value, which is why I prefer to use an agri-horticultural metaphor for design as opposed to an business-industrial metaphor of speed and strategy which is usually bandied about. Here below, I present the first list of 50 suggested action areas for NID in the changed context of Indian design landscape and invite NID alumni and the Indian design professionals to contribute to shaping the NID of the future. The call is for suggestions and discussions for the course of action to be initiated and followed so that in our eagerness to change and grow we do not throw out the baby with the bathwater! This list is not categorized nor is it prioritized and I invite our stakeholders and well-wishers to contribute to help streamline its acceptance and implementation with some degree of success. Quote: List of 50 suggestions given to Chairman Education at NID and to the Director NID for their consideration and appropriate action in the days ahead. 001. Faculty Recruitment Multiplier Programme (for all design schools). 002. FDC Revamp – Programmes + Infrastructure at Gandhinagar. 003. Faculty Training – New Centre & Programmes. Build linkages worldwide for design trainers who can help faculty development and research support programmes for existing faculty. 004. Adjunct Faculty & Visiting Faculty – Contact / Exposure. Expand faculty base in a systematic and sustained manner by signing MOU’s with Adjunct Faculty and Visiting Faculty at an Institutional level and monitor their contributions. 005. Faculty Publication – Education / Academic – Evaluation Criteria – Publish Courses. 006. Gandhinagar Campus – Modular Structure – Abandon Current Plans. Stop all further construction at Gandhinagar based on old plans since they do not work and have proved to be poorly conceived. Fast track the redesign of a modular building based on NID Paldi campus that is tried and tested format for a design school. Change architects if necessary. 007. Document NID Education – Foundation + Others. Initiate immediate documentation of all NID education programmes and get a team in place to carry this out and all faculty shall contribute each of their courses so that at the end of two years all courses are published in a basic form and in another two years all courses are covered in a revised and more detailed format. 008. Website & Intranet Revamp. Complete revamp of website administration and put together a competent team with faculty committees to manage web content and make policies to make it happen. 009. Faculty Status Review – parity with IIM / IIT. Initiate dialogue with Government and Governing Council for a review of Faculty status in the country on par with IIT and IIM. 010. KMC Document Archive in PDF + Share. Initiate the process of converting all NID craft documents, diploma documents and project documents into pdf format along with policies to make them available on the web in a Creative Commons and Open Source format. 011. KMC Prototype Restore (Pompidou Centre). Initiate process of research and assessment to restore all prototypes in the KMC collection with the assistance of experts and inside research teams. 012. KMC Books Multi Copy List / Multi Centre. Prepare a list of critical books for design education and initiate processes for getting multiple copies or for local print editions that can make these critical resources available freely inside India to support the spread of design education in India. 013. NID Design Workshop Revamp – 21st Century WS. Plan and identify a range of machines and hand tools that are available today to build and operate a high quality model building workshop suitable for a world class design school of the 21st century. 014. Design Workshop + Craftsmen Integration. Initiate processes that will bring high quality craftsmen to the NID studios either full time or part time to support education at the Institute. 015. Faculty Incubation + Liberalisation. Liberalise norms for faculty consulting and unshackle NID faculty after 50 years of restrictive controls that have proved to be counter productive and build a platform for the incubation of many new initiatives in a design rich environment where teachers and students can build the industry of the future. 016. KMC Photo Archive Digitise & Share. Strengthen systems and supports in the KMC and NID Photo Department and liberalise the access and use of NID archives and provide digital access to all NID resources since they are a product of public funding. 017. KMC Diploma Projects Digitise & Share. Initiate methods to collect all future diploma and craft documents in digital format with some uniform guidelines for sharing these as and when they are ready and can be made available for public review and use. 018. Course Documentation and Digital Archive. Initiate processes for the production and sharing of all course documentations so that these become the defacto standard for teaching across the country and encourage other schools to do so themselves. 019. Curriculum Review & Publication. 020. National Design Leadership Programme. 021. NID Alumni in NID GC and IDC. Advocate the inclusion of NID Alumni on NID Governing Council as well as National Bodies such as India Design Council. 022. Design Thinkers Forum: Cross Institutional Body. Create a National Think Tank for Design Issues across all Institutes for Academic as well as Professional excellence. 023. Localised Curriculum for Regional Design Schools. Identify and Build local agendas for local action in Regional Design Centres and Schools. 024. Sector Focused Institutes (IICD & BCDI Models). Sector specific feasibility studies for new Design Institutes to be undertaken with specific parent Ministries to ensure decentralized funding and nurturing of each sector in design need. NID is too dependent on DIPP, which has shown limited vision for Design use in India. Other Ministries to be tapped for expanding the user base for design with financial supports from each such Ministry. 026. Develop Design Agenda for Lok Sabha Constituencies. Design for public good to be explored in cooperation with Lok Sabha MP in each constituency using the discretionary funds available with each MP. 027. Design Library for Schools x 10,000 by 2010. (Rs 100 crores value – Digitise and deliver in Rs. 1 crore). Build resources for school level action in design education and projects of local relevance. 028. Clean NID Administration – Transparent and Efficient by 2010. Bring Transparency to all NID Administrative and Accounts actions and make all Administrators accountable and effective with supports and training. 029. Revive Consultative Processes at NID – Document and Share. NID has a unique tradition of Consultative Processes, which needs to be revitalized and made more visible through Documentation and Public Sharing. 030. Discipline Specific Publications – Multiply. Design deals with huge variety and this calls for decentralized Publication Programme at the Discipline Level to reach partner agencies in each sector. 031. FAB Lab / Model Lab / Innovation Lab - Multiply. NID facilities for prototyping and model making have been decimated and are outdated. These need to made best of class and replicated at each centre with education programmes. 032. Alumni Association and Corpus Fund (Alumni Corpus). Partnership with NID Alumni to be revived with active moves from NID towards the building of linkages and a corpus fund for activities. 033. Industry Association for Design Partnership (CII ++ / Industry Corpus). Partnership with Indian large, medium and small industries to be revived with active moves from NID towards the building of linkages and a corpus fund for activities with support from appropriate Ministries. 034. 10,000 School Contact Programme – Teacher Registry Online). Use internet access and build an active school contact programme by offering curriculum and training supports online to a large number of schools – target 10,000 by 2012. 035. T1 Internet for all Users at NID and Web 2.0 Standards for Communication. Build high quality Internet platform for NID teachers and students for design research and action and use this platform for other value rich activities. 036. Full Transparent Accounts – Full Disclosure Norms. Adopt new policies for Full Transparency in all Administrative activities and Accounts and build on the RTI principles adopted by Government of India and go further like Infosys. 037. Copy-Left Movement for all Student Projects – Share & Promote. Participate in Open Source Movement by making all NID student and Faculty Research accessible to all sectors of our society. 038. Co-Create / Co-Incubate / Collaborate – Outreach Policies. Develop and institute Outreach Policies that encourage and incubate innovative action in hundreds of initiatives across numerous sectors. 039. 230 Sector Survey & Monitor Design Opportunities. Initiate series of Brainstorming and interaction platforms that can help build a massive Design Opportunity database, which can be categorized, prioritized and action programmed in cooperation with stakeholders. 040. 230 Sector Partner Agencies with Shared Strategies. 041. Rooster of Visiting Faculty & Active Contact Programme. Database of Design Teachers for NID and other schools with focus on their interests and capabilities and the qualifications may be as a backdrop. Encourage documentation of a portfolio of course work and access of these online. Continue the effort with NID Fulltime faculty and build an archive of interests and capabilities and not just listing of qualifications. Encourage growth and maturation through participation in training and conferences etc. 043. Research Agenda Mapping for Design Action. Identify and map out areas of priority and need as well as sources of funding for each such area. 044. Sector Specific Strategies & Partnerships. Sector specific think tank sessions to draw up lists of active partner agencies, individuals and activities that can be sustained by NID Faculty in small buddy teams with common interests. 045. Ministry Specific Budget claims and Action programmes. Action plans for each Ministry to be managed by active contact with the specific Ministry and an identified champion from within NID Faculty. 046. Policy Level Involvement of NID Faculty. Encourage NID Faculty to be outspoken on areas of National Policy and support their research in these areas of declared interest to achieve national visibility and credibility through their sustained work. 047. NID Faculty on Planning Commission. Policy Level involvement to be extended to being included in the Planning Processes at the level of the Planning Commission in a number of sectors where NID faculty have real expertise. 048. Faculty Forum: Discuss / Dialogue / Debate – Document & Share. Policy shift from being secretive to being open especially in the think tank sessions within the Faculty Forum which should once again become a platform for dialogue, discussion and debate on matters of Institutional action and this should be shared as a source of inspiration for students and other agencies. 049. Design Opportunity Mapping of 230 Sectors & Ministries: Brainstorm / Document / Publish / Advocate. Build a massive database of National and Regional sector and category specific design opportunities as imagined by NID Faculty and Students and Publish the same a san agenda for action by the National and Regional leaders and politicians. These can be revisited in some chosen frequency, say once every five years, or before each round of National and Regional elections. Revisit the spirit of Eames Report and do what the Founding Fathers of NID did in the first decade by bringing in the best designers from India and overseas back to our campuses and get students and faculty to use this exchange to build new capabilities and share these in a major celebratory exhibition at the end of the programme and do this through the web as well.